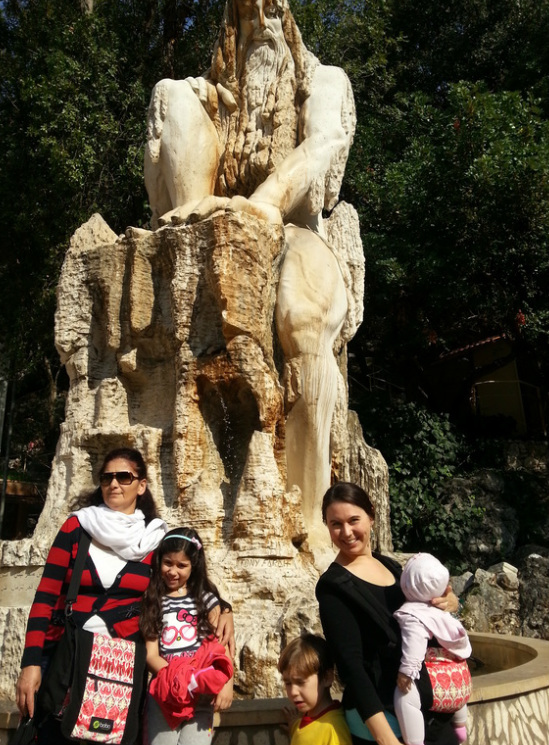 "The Guardian of Time", a statue at Jeita Grotto in Lebanon, elaborate underground caverns millions of years in formation, visited here by three generations of the Assaf family. The Kirkos Caravan was created as a personal path to learn and embody the Four Cycles of Life, to share those lessons and insights with our community through the Cottage School, and to bring audiences joy and inspiration through our storytelling theater performances. We collect and tell tales that guide us through each day’s significance and the four cycles of life. If you know of a wonderful story that would capture the essence of these themes, we'd love to hear from you! Winter officially begins around the winter solstice and the great feast of the Nativity of Our Lord, when the earth is farthest from the sun but when it begins the journey back toward the light. We begin our year by reflecting on the end of the journey to better understand where our path will lead in the end and the best way to arrive at our desired destination. In winter, the Earth rests and prepares for rebirth. At home we gather around the hearth to bake comforting foods, to warm our hearts by sharing stories, and to create light in the midst of darkness. In the winter of life, the Sage must necessarily rest and prepare mind and soul for the journey ahead. A slower way of life can facilitate reflection and availability to the younger generation, to pass on lessons learned, advice, personal testimony, and stories of a full life. Spring occurs around the time of the vernal equinox and the Feast of the Annunciation. A miracle every time it happens, the earth that appeared to us to be dead slowly sends forth delicate and tender signs of new life that surprise and enchant. The clutter is cleared away, the soil is tilled, seeds are planted, and new growth is tended to nurture its potential to provide us with a plentiful harvest in the future. The Apprentice is born helpless and completely dependent on her elders to teach her about the world and what it is to be born into the human race. During the first quarter of her life, she is growing and learning faster than she ever will during the rest of her existence, culminating in the final fusing of the prefrontal cortex (the area of the brain that facilitates the ability to reason and use judgement) at around the age of 25. The summer solstice around the Feast of the Nativity of St. John the Baptist brings celebrations of light late into the night, but also heralds the beginning of the shortening of days in the next half year toward the birth of Christ, the Light-Bearer, recalling the words of John the Baptist: “He must increase, but I must decrease” (John 3:30). The earth is in full, glorious bloom and at the closest point to the sun of the year- a celebration of life at its fullest. The Missionary has discovered and trained for her vocation during the Apprentice season of life and now goes into the world as an adult to fully live out her mission. The autumnal equinox brings the busy, beautiful, and melancholy season when the produce is quickly harvested and preserved for the harsh days ahead. The farmer reaps what he has sown and toiled over in the previous two seasons and what his life depends upon in the season ahead. It is a time of either regret or gratefulness for the past. The Teacher enters a new stage when she, too, reaps what she has sown in the previous seasons of life. It is a time when she can enjoy the fruits of her labors with the confidence of her experience behind her, and train the rising generations with the skills she has acquired. -Natural Science: what is happening with the Earth, its vegetation, and its creatures during this season? What is happening in the skies and how does that affect what is happening on Earth? Project: Find or make up stories that help explain the season. Go on a nature study, conduct an experiment, collect seasonal bits of nature and create a work of art to present as a gift to a friend or a stranger. -Homesteading, Agriculture, and Cultural Traditions: How do farmers interact with the earth to care for it and themselves during this season? What cultural traditions have developed in different areas of the world that celebrate and commemorate the season, its produce, its tasks for survival? What is the connection between the art of surviving and the art of thriving? Project: Find some appealing recipes that include your favorite produce of the season. Invite friends and family to cook with you and at the same time try a new seasonal cultural tradition (craft, dance, prayer, etc.). Write and illustrate a story about some aspect of homesteading or a cultural tradition during this season. 2. The Seasons of the Church and Feasts: How does the season of the Church correspond with the season of Nature? What do the Feasts during this season teach us about the story of man’s redemption? What are some traditions that have grown up around this season and for particular feasts? Project: Invite your friends and family to observe these feasts and some of these traditions with you during the season. Write and illustrate your own book with a story related to a favorite liturgical feast during the season. 3. The Sanctoral Cycle: Who are your favorite saints during this season and why? Project: Tell their story and pick out the virtues that helped them become holy. Do something to learn from the example of one or more of your favorite saints (charitable act, holy hour, etc.) Go on a pilgrimage to a place associated with one of these saints to learn more about them and walk in their paths. Write and illustrate your own book about a favorite saint. 4. The Season in a Human Life: How does the natural season correspond with the season of life? How are we transformed during this season of life? How do these changes help us grow into the next season of life? Project: Have a conversation with some friends or family members who are in this season of life as well as ones who have already passed through it. Ask them to tell you their life stories and see if you can identify some common qualities of those individuals in the same season of life. How do the older friends view that season now that they have had the time and distance to reflect upon it? How do you imagine you will be when you grow into this season of life? What do you need to learn and do during this stage to grow into the kind of person you want to be in the next stage of life? Create a book by writing and illustrating the life story of someone who shared his or her memories with you and present it to your friend as a gift. The Apprentice Stage: Volunteer as a tutor, help a younger sibling learn a new life skill, mentor a troubled youth. The Missionary Stage: Send care packages to missionaries abroad, donate to a missionary order, support a vocations drive. The Teacher Stage: Honor the teachers in your life with a handmade note of appreciation or a gift of a memory book of your lessons. The Sage Stage: Visit an assisted living home and listen to residents' stories. Create a book of wisdom quotes gleaned from the sages in your life.